Trek duration : 23 nights/ 24 days. Trek start/end: Fly in/out at Suketar Airport in Taplejung. Trek grade: Difficulty due to high alitude. Trek season: September to November and April to June. Highest elevation : Pangpengma 5160m. Viewpoints: Jannu, Pangpengma and Oktang. Villages: Phurumba, Sekathum and Ghunsa etc. Ethnic group: Bhraman, Chhetri, Rai, Limbu and Bhotia etc. Culture: Hindu, Kirant Mundhum and Buddhist. Himalayan Scenery: Mt. Kumbhakarna (Jannu 7710m), Mt. Kanchenjunga I (8586m), Kanchenjunga II (8476m), Kanchenjunga South (8476m), Kiratchuli (Tent peak 7365m), Nepal Peak (6910m), Pathivara Chuli (7125m) and Many other peaks etc. 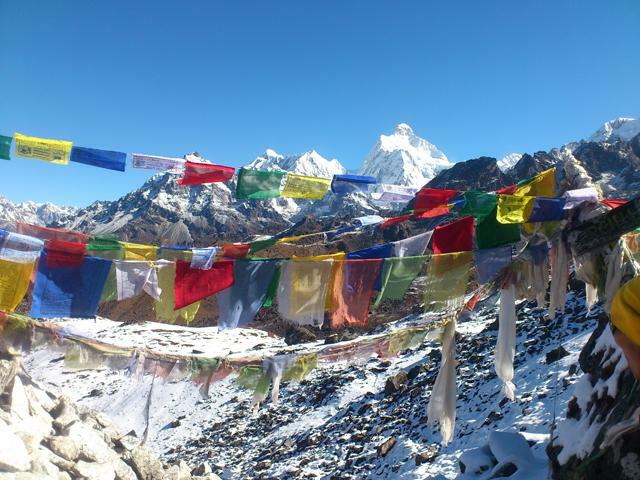 Trek price $2160 per person Views from Pangpengma. Trek price $2160 per person Mt Junnu views from Sele La. 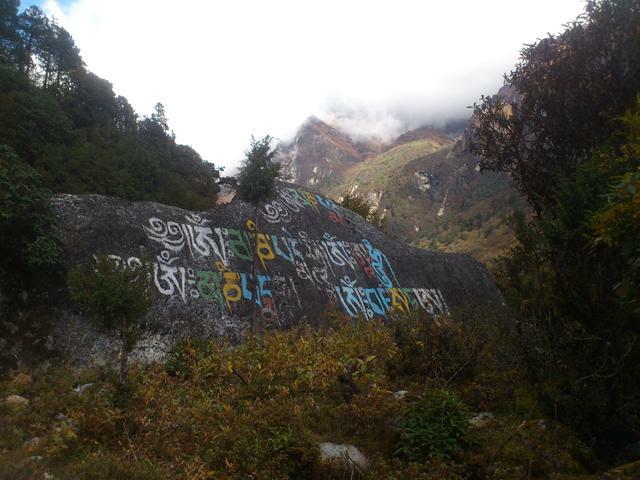 Trek price $2160 per person OM MA NE PADME HUNG. 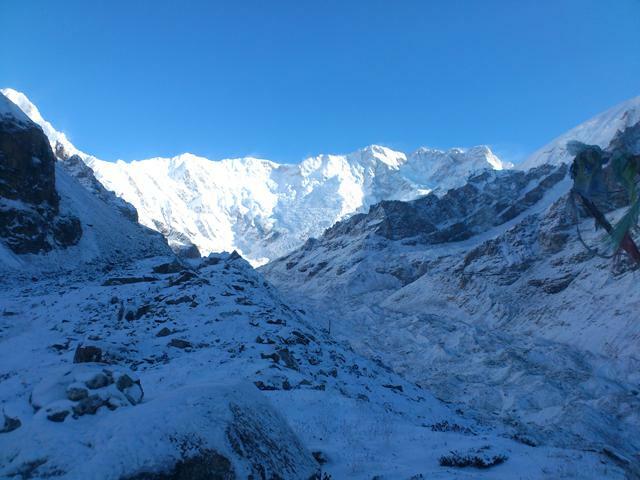 Kanchenjunga Base Camp Trek is in the eastern part of Himalayas of Nepal. Mt. Kanchenjunga is the third highest peak in the world at an elevation 8586m. Circuit trek around Kanchenjunga is getting popular now a day because it has basic room at teahouse from September to November and April to May. We see the panoramic view of Kanchenjunga, Makalu and Everest and also this trek offer high alpine vegetation and verity of Rhododendrons, Fir, Pine, Home Lock, and Oak trees. 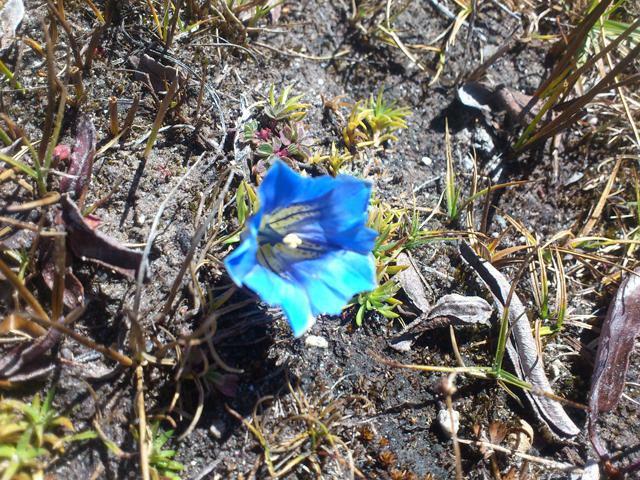 This trek is also rich in wildlife such as the Snow Leopard, Clouded Leopard, Blue Sheep, Wild Goad, Marmot, and Weasel. 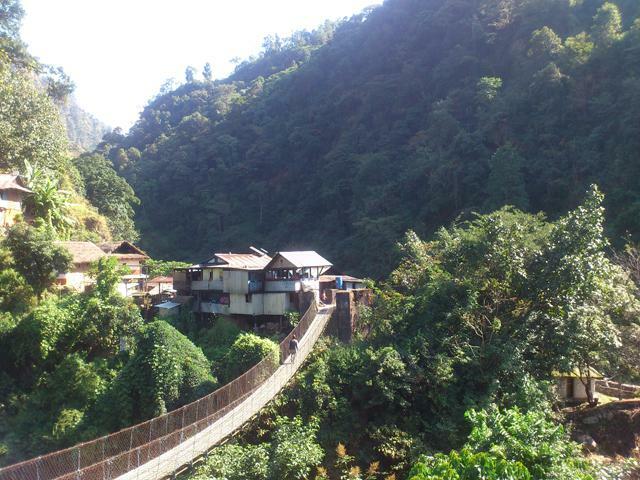 During the Kanchenjunga Trek, we visit Ghunsa – the Bhotia village and other several villages of Rai and Limbu who are the mainstays in the British Gorkha Regiments. We spend two nights in Ghunsa for safe acclimatization before we are pushing to Kanchenjunga North Base Camp – Pangpengma 5160m. There are spectacular views of Jannu Himal, Nepal Peak, Kanchenjunga I (8586m) and it’s glacier from Jannu viewpoint at an elevation 4400m. We back to Ghunsa village and go to South Base Camp of Kanchenjunga by crossing Sininon (Selele) La at an elevation 4646m. After Kanchenjunga South Base Camp, we go to Taplejung with up and downhill walk on narrow trekking path which is more adventurous. Trek to North and South Base Camp of Kanchenjunga start and end at Suketar Airport in Taplejung. There are operating flights to Suketar Airport from Kathmandu once in a week. There can also reach to Taplejung from Kathmandu after a long bus journey. Our company representative helps you transfer to Hotel from Kathmandu International Airport. We give you information about things to do in Kathmandu. Day 02: Trek briefing and preparatoin. 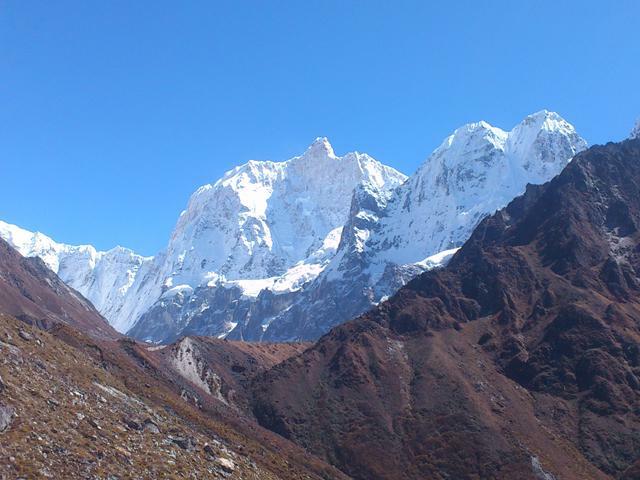 Today, we brief about day by day itinerary and obtain special hiking permits for Kanchenjunga Base Camp Trek. Day 03: Kathmandu to Suketar flight. Day 04: Suketar to Phurumbu 4-5hrs. Day 05: Phurumbu to Chirwa 1246m/6-7hrs. Day 06: Chirwa to Sekthum 1585m/5-6hrs. Day 07: Sekthum to Amjilosa 2395m/5-6hrs. Day 08: Amjilosa to Syabla 2730m/5-6hrs. Day 09: Syabla to Ghunsa 3427m/5hrs. Day 11: Ghunsa to Khambachhen 4027m/4-5hrs. Jannu Himal is also known as Kunmbhakarna Himal. 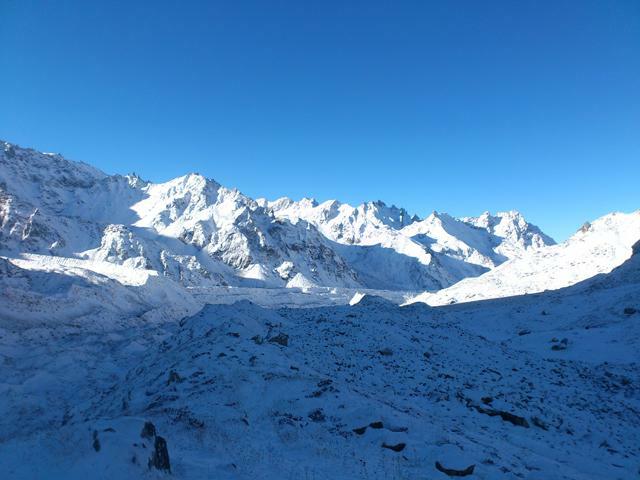 Junna viewpoint offers breathtaking views of Jannu Himal, Khabuer and Phole Peak to the East, Mera Peak to the South and Kanchenjunga glacier to the North. Day 13: Khambachhen to Lonak 4780m/4-5hrs. Day 14: Lonak to Pangpengma and back to Lonak 7-8hrs. Day 15: Lonak to Gunsha 3427m/6hrs. Day 16: Gunsha to Selele Banjyang 4480m/5hrs. Day 17: Selele Banjyang to Sininon (Selele) La 4646m to Tseram 3870m/6-7hrs. Day 18: Tseram to Ramche 4580m/5hrs. 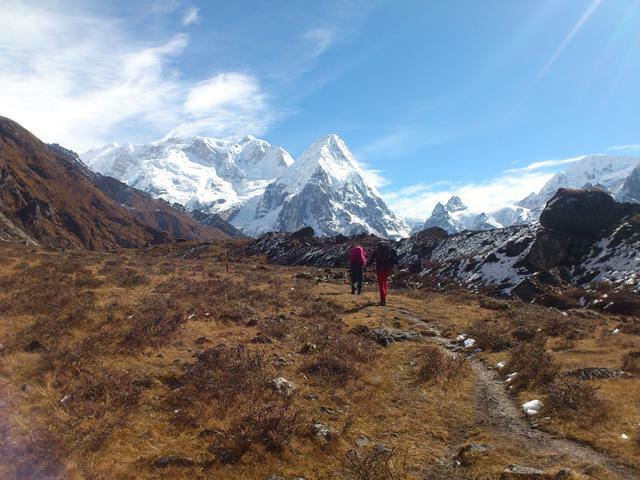 Day 19: Ramche to Oktang - Kanchenjunga South Base Camp 4730 to Ramche (a day hike for 6-7hrs). Day 20: Ramche to Dorongdin 3000m/7hrs. Day 21: Dorngdin to Yamphudin 2080m/7-8hrs. Day 22: Yamphudin to Mamankhe 1785m/6hrs. Day 23: Mamankhe to Khesewa 2120m/6hrs. Day 24: Khesewa to Lali Kharka 2265m/6hrs. Day 25: Lali Kharka to Suketar/Taplejung 1820m/5hrs. Day 26: Suketar to Kathmandu fly out. Day 27: Visit in Kathmandu. Day 28: Visit Patan and Bhaktapur. Day 29: International Airport departure. Trek itinerary can be changed for an interesting side trip and additional days for acclimatization if needed while on the trek. 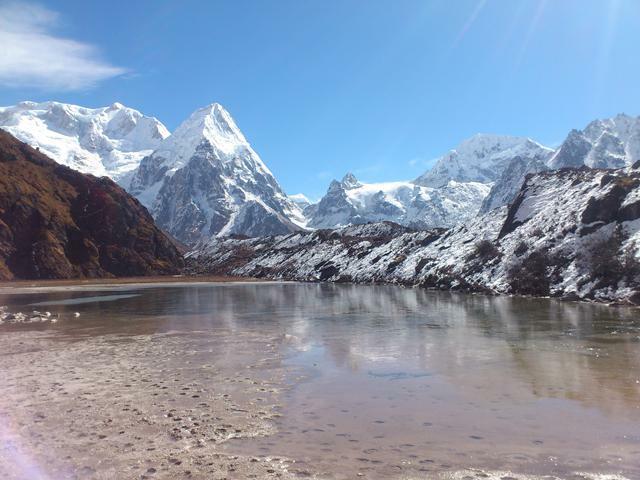 Do you have questions about Kanchenjunga Base Camp Trek? Or, would you like to see how it can be customized to your needs? Please DM us. The following cost and date are for per person for online booking. If the Kanchenjunga Base Camp Trek departure dates do not match for you, please DM us and we will happily customize your trip on the date that you need. 2 nights accommodation (standard twin bed room with breakfast) at 2** Hotel in Kathmandu. Note:- if you arrange yourself International Airport transfers and accommodation in Kathmandu, we will reduce cost form package. Kanchenjunga Conservation Area hiking passes. Kathmandu to Taplejung - Suketar Airport flight tickets for clients, guide, and porter. Teahouse meals for clients: 24 Breakfasts, 24 Luches and 23 Dinners with tea/coffee etc. Meals can be selected from menu and will have enough daily. Local trekking staffs: an experienced guide and porters. Horse or Yak or private jeep renting while on the trek. Please read carefully cost includes and does not include above. All the meals are included with tea/coffee while on the trek. We do not include drinking water or boil water which you can buy at teahouse; this is $1 to 4 per liter. You can take water purified tablets or Seripen for a cheaper solution. Wi-Fi, battery charge and hot showers are not included. Battery charge is $2 to 10 per hour per device (you can take power bank for a cheaper solution). The gas shower is USD3 to 7 per head. In case Taplejung – Suketar flight is canceled due to weather condition, you are responsible for extra Hotel nights and meals in Kathmandu and Suketar for any extra days. Do not require extra payment for rescheduling Suketar flight due to canceling of weather. But, there is a direct flight between Kathmandu and Suketar once in a week. If there are unexpected circumstances such as flight cancellation due to weather condition, we offer you an alternative trip. unavoidable part of the agreement. The following are different methods of trip booking advance payments for your convince. booking advance in money to us. 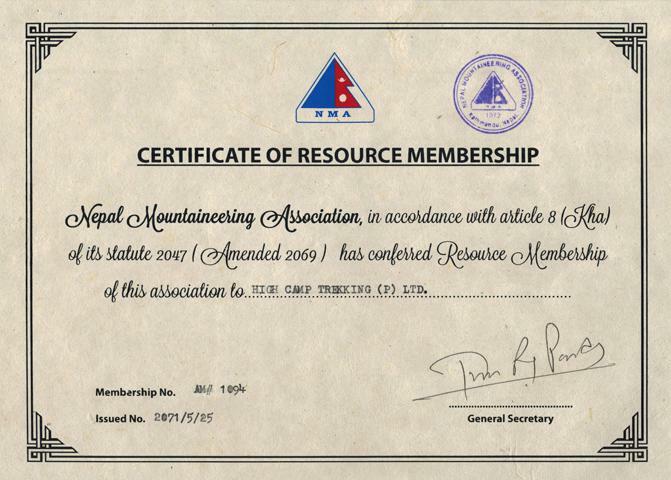 Note:- There are more similar to our name of other trekking agencies. Please remember that we are known as High Camp Trekking.